None of us can deny that they have fallen prey to the lure of a junk shop or of the chaotic mysteries of an attic, and sometimes purchasers of an old wardrobe or chest of drawers find there a bundle of treasure left behind … well, the spirit of 'What have we here?' permeates the adventures captured on this album. Salon music had its heyday on record in the era of 78s, since the length of a side suited it so well, and for that reason some titles—such as Rubinstein's Melody in F and Paderewski's Minuet in G—may be familiar, but there are 'finds' to be had in any such compilation. This is music on which most aspiring pianists have cut their teeth, giving them as it does both the satisfaction of mastering a complete piece without straining their technique (well, mostly) as well as the backbone of a repertoire that makes for a welcome family evening around the piano; alas for us all that we cannot offer renderings of such sympathetic finesse and lyrical elegance as are here set down by Philip Martin 'at home' and off-duty from his award-winning complete Gottschalk recordings on Hyperion. Towards the middle of the nineteenth century the piano came of age. Significant technical developments to the instrument had made possible greater agility and a more brilliant tone; iron-framed grand pianos had been introduced, strong enough to withstand the onslaught of the most demanding virtuoso. Equally significant, mass production made the upright piano an affordable, convenient and highly desirable acquisition for the home. Between 1850 and 1910 the number of pianos manufactured in Britain rose from 25,000 to 75,000. During the same period in America the figure increased from 900 to a staggering 360,000. For the gentleman amateur and well-schooled young lady, the most popular ‘serious’ works, as gauged by the cheap albums of the day, were those with the broadest melodies and which produced the greatest effect. Movements from Beethoven Sonatas, the simpler Chopin Nocturnes, Mendelssohn’s Songs Without Words, short pieces by Schumann and the easier Impromptus of Schubert were ubiquitous choices. To cater for this new class of executant music-lover, a whole school of composers emerged, using the continental Romantics as their models, who usefully occupied a kind of midway position between the Great Composers and the pedlars of cheap piano-fodder. In the 1850s this music tended to reflect the current preoccupations with death and sentimentalized religion; by the 1890s this had broadened to embrace music of a much lighter vein and which took itself less seriously. In that pre-gramophone, pre-wireless era, every European and American piano stool of a hundred years ago contained copies of—well, the kind of music resurrected and, yes, celebrated in this collection. Not all of it is easy to play from a technical point of view; many provide even greater musical and interpretative challenges; not all of it is good music (to use that as a selection criterion would be to miss the point); some of it (the Handel, Beethoven and Paradies works) comes from an earlier age, of course. But whatever its provenance or musical merit, little of the music on this album is ever heard in the concert hall today. Sadly, few professionals would risk programming even so endearing a work as Rubinstein’s Melody in F because of its associations. Yet some of these piano compositions are among the most popular pieces ever written for the instrument. This distinction, however earned, should surely be saluted. And bravo Philip Martin for rummaging through all those boxes of second-hand music, repairing their grubby, torn and well-thumbed pages to let us hear again the music in which our grandparents and great-grandparents took so much delight. A century or so on, perhaps we may share their pleasure. Like so many of his peers in this collection, Christian Sinding (1856–1941) has had to bow to history and be remembered for a few brief minutes from his entire life’s oeuvre. Of one hundred and thirty-two separate works, all his symphonies, operas and chamber music have disappeared, though his masterly Suite in A minor for violin receives the occasional airing. And once again, as illustrated by other titles in this anthology, it is a single piece from a collection that provided the composer with his one enduring international success. Frühlingsrauschen (Rustle of Spring) was a quintessential item in every piano stool, though its five flats and fast chromatic runs must have proved daunting to many an aspiring amateur. It is surely our loss that such an inspired miniature should be considered too hackneyed to be heard in concert these days. Should we dismiss out of hand The Maiden’s Prayer, ‘this dowdy product of ineptitude’ (Arthur Loesser) that has become a comical byword for sentimental salon tosh? Most people do. It is now past parody, its title far better known than the music itself for no one plays it, not even the soppy amateurs whose territory it was and who so relished its ‘dripping, maudlin arpeggios’. Few could tell you the name of its composer. But hold! Despite the fact that it has no catchy theme to sing or hum, that its octave arpeggios are not easy to execute correctly, and that its four ‘variations’ (if one can dignify them with that term) are devoid of musical interest, The Maiden’s Prayer is probably the biggest selling piece of piano music ever written. Over one hundred editions were published in the nineteenth century and in 1924, more than sixty years after its first appearance, a Melbourne music publisher admitted to selling ten thousand copies of it a year. Its unique status notwithstanding, little is known of the short life of its Polish composer. Tekla Badarzewska (1834–1861) wrote it when she was just seventeen and had it published in 1851 in Warsaw as Molitwa dziewicy (‘The Maiden’s Prayer’). It was republished as a supplement to the Paris Revue et Gazette Musicale in 1859 from whence it spread round the world like a plague. There are a further thirty-four piano pieces by Badarzewska, including one entitled Prayer Answered. Thankfully, it failed to capture the public’s imagination. An ungentlemanly German critic in his obituary of Badarzewska opined that ‘[her] early death saved the musical world from a veritable inundation of intolerable lachrimosity’. Far greater composers than Badarzewska have shone brightly and profitably around the world before descending into obscurity. 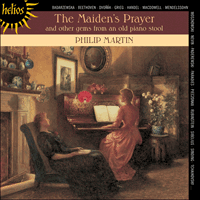 For better or worse The Maiden’s Prayer, if not the name of its composer, will never be forgotten. Quite an achievement for a teenage female Polish composer of the 1850s. Hard to dismiss in fact. The great violinist Fritz Kreisler visited the ailing Antonín Dvorák (1841–1904) in 1903, so the story goes, and was handed a pile of (mostly unknown) music. Among them was a set of eight Humoresques for solo piano that had been composed in August 1894 and published that autumn by Simrock of Berlin. No 7 of these, the Humoresque in G flat, took the violinist’s fancy and, though Dvorák intended it as a light, whimsical caprice, Kreisler’s arrangement turned it into a slower, sentimental piece. His (four) recordings and performances of ‘Dvorák’s Humoresque’ made it universally popular and it was subsequently arranged for every imaginable instrumental combination (Kreisler even made a recording of the original piano version in 1914). The remaining seven Dvorák Humoresques are almost never heard. Selim Palmgren (1878–1951) has been characterized as ‘a very unequal writer … a typical Vielschreiber who unwearyingly provides material for the maw of the publisher’. But among his piano miniatures one encounters many beautifully executed gems. Piano buffs treasure the two numbers championed by Benno Moiseiwitsch (Refrain de berceau and West Finnish Dance) and Eileen Joyce’s entertaining scamper through En route. Kevätyö—May Night (or Night in May as some editions have it)—is surely one of the finest of Palmgren’s delicately wrought tone poems. It comes from his collection of seven pieces entitled Spring and is typical of the Finnish composer’s atmospheric writing, its impressionistic harmonies tinged with Scandinavian colours, a close relation to some of Grieg’s Lyric Pieces. ‘After Chopin’, wrote Paderewski, ‘Moritz Moszkowski (1854–1925) best understands how to write for the piano, and his writing embraces the whole gamut of piano technique.’ Perhaps we may look askance at this statement today, but Paderewski was not far wide of the mark. Moszkowski’s untroubled, graceful, melodic and well-crafted piano music is expertly laid out for the hands. No one could pretend that it is deep music but, as one writer put it, ‘if it fails to stir the intellect, it sets the pulses tingling’. Moszkowski’s music was in the repertoire of many great pianists, among them Hofmann—who studied with Moszkowski and received the dedication of his piano concerto—Godowsky, Bauer, Lhevinne, Rachmaninov, Friedman (who recorded the Serenade), Horowitz and Cherkassky. Even without his affluent background, Moszkowski would have been able to live comfortably on the early successes of his Spanish Dances, Op 12 (for piano duet) and the Serenata. Its lilting melody attracted the attention of lyricists: one Nathan H Dole wrote the frightful ‘I wait beneath thy window, love’ (recorded in 1915 by Fritz Kreisler and John McCormack) while a rather more sensitive German handling of the tune, ‘Liebe kleine Nachtigall’, attracted the talents of Richard Tauber (1935) and Miliza Korjus (1936). Few pianists have rivalled the celebrity of Ignacy Jan Paderewski (1860–1941). For decades, his name was synonymous with his instrument. Though many virtuosos then and now have far exceeded him in technique and his recordings betray a Romantic’s freedom with the written text, Paderewski exercised a fascination over his audience that bordered on the mesmeric. As a composer, few of his works have survived—his opera Manru enjoyed brief success as did his Piano Concerto—but nothing he wrote came remotely close to the popularity of his Minuet in G (there is another Paderewski minuet—in A major, No 7 of Miscellanea, Op 16—but this one in G major is the ‘Paderewski Minuet’). In his memoirs, the composer gleefully relates how it was written as a joke. While staying in Warsaw he frequently played Mozart to two elderly friends. Having exhausted his Mozart repertoire, Paderewski decided to write something in the style of Mozart and see if it would be spotted. Having heard the half-improvised piece (without the cadenzas, which would be added later), Paderewski’s friends refused to believe that it had not been written by Mozart, still less that they had just heard a performance by its composer (the Minuet’s Schubertian references obviously escaped them). The friends forgave the prankster and, of course, thereafter always insisted that he plays his Minuet whenever he visited, a request repeated wherever Paderewski appeared for the remainder of his long career. Its first concert performance was given by Anna Essipoff (1851–1914), the wife of Paderewski’s teacher Theodor Leschetizky, and it was through her championship that the piece by the then unknown Pole became widely known. Paderewski himself recorded his Minuet six times for the gramophone—in 1911, 1917, 1922–23 (two different takes appeared on HMV DB379), 1926 and 1937. The harmonious blacksmith is the fourth and final movement of George Frideric Handel’s (1685–1759) fifth harpsichord Suite from the first volume of his  Suites de Pièces pour le Clavecin published in London in 1720. The music was written as early as his first year in London, 1710, or quite possibly brought over with him from the continent—a passage from Handel’s Almira, written in 1704, is very like The harmonious blacksmith; a bourrée by Richard Jones (1680–1740) apparently features almost the same air in a minor key, though it is not known whether Jones preceded Handel or vice versa. What is certain is that the Air and variations has nothing whatever to do with a blacksmith, harmonious or otherwise. The fictitious story that Handel first heard the air sung by a blacksmith in Edgware (London) while sheltering in a smithy during a storm was put about by the notoriously inventive antiquarian Richard Clark (1780–1856) in his Reminiscences of Handel (1836). The probable true origin of the nickname derives from a music-seller in Bath named Lintern who had been brought up a blacksmith but turned to music. It was the Air and variations that he was constantly asked to play and so decided to issue the single movement himself entitiling it The harmonious blacksmith. However, no copy of Lintern’s edition has ever surfaced. The earliest known printed version of the music bearing this title dates from 1819—in an arrangement for piano duet. There are seven collections of short pieces by Pyotr Tchaikovsky (1840–1893) bearing the title ‘Morceaux’. The earliest of these appeared in 1870, the last in 1893, fifty-three tasty morsels in all. Op 40 consists for the most part of dance movements and songs-without-words of ‘moderate difficulty’ for children. The best-known are the two Chopinesque waltzes (No 8 in A flat, which Rachmaninov thought of well enough to record, and the mournful No 9 in F sharp minor). Chanson triste (in G minor), finds Tchaikovsky at his most economical and affecting, its haunting opening theme (la melodia marked to be played con molto espressione) giving way to a reluctantly animated middle section, before returning to the subject of quiet resignation. The great Benno Moiseiwitsch recorded it in 1945. Though Jean (Julius Christian) Sibelius (1865–1957) began piano lessons at the age of eight (soon forsaking the keyboard for the violin) and studied under Busoni in Helsinki, the piano was not his prime means of expression. His orchestral, vocal and stage works so overshadow the rest of his output that it is something of a surprise to discover that Sibelius wrote one hundred and thirty-four separate pieces for the piano within thirty-five opus numbers. Few can be said to be representative of his art at its greatest and only his celebrated Valse triste, Op 44 No 1 (an arrangement from the orchestral original) and Romance in D flat, Op 24 No 9 have ever achieved much popularity. Philip Martin makes a convincing case for The spruce tree (Kuusi), however, an economical sketch of touching and, some might say, characteristic brooding melancholy. Various members of the Mason family were prominent in America’s musical life for one hundred and fifty years. Lowell Mason (1792–1872) was a composer, organist, conductor, pioneering musical educator and his country’s foremost promoter of choral singing; his son Luther Whiting Mason (1828–1896) was a notable musical educator who, in 1857, published a Book of Chants for community singing in conjunction with Dwight Hamilton Baldwin, soon to be the founder of the Baldwin piano company; Luther’s brother, Henry, was the co-founder with Emmons Hamlin of the Mason & Hamlin piano company; Henry’s son was Daniel Gregory Mason (1873–1953), who became an eminent composer and educator. Lowell Mason’s youngest son is our man—William Mason (1829–1908), a celebrated concert pianist and educator. He studied with Moscheles in Leipzig, Dreyschock in Prague and Liszt in Weimar, returning to the United States in 1854. It is claimed that Mason’s tour of 1855 was the first in America to be devoted exclusively to piano recitals (i.e. a programme with no ‘assisting’ artists). Tiring of touring, he settled in New York as a teacher and exponent of chamber music. The catchy and effective (i.e. not too difficult) Tarantella in A minor is the first of Pieczonka’s ten Danses de salon which include among their sequence of titles the Chopinesque Mazurka de concert, Valse in A flat and Grande polonaise héroïque, as well as the more tempting prospect of Danse des fantômes, Wanda – mazurka brillante and Salon-walzer über Namen ‘BACH’. Almost certainly Polish, perhaps of Silesian extraction, Albert (or was it Alfred?) Pieczonka (1828–1912) is an elusive figure. Despite assiduous international enquiries, your annotator has, frustratingly, been able to unearth barely a single biographical detail about the composer. The popular monthly periodical The Etude that served American music teachers for sixty-five years (1883–1948) dedicated its entire February 1915 issue (Vol 33 No 2) to Polish music. Page 128 carries a short piece, Hommage à la Pologne – mazurka (one of the Salon Dances) by A Pieczonka, yet the ‘Directory of Polish Composers’ in the same issue avoids mention of his name. Probably dating from around the turn of the twentieth century, a total of more than forty works were issued by various publishers in the United States and abroad (including Schirmer, John Church, Augener and several others). The sixty-six piano pieces that Edvard Grieg (1843–1907) gathered into ten volumes of Lyric Pieces show the Norwegian composer at his best—a master miniaturist and tone-painter. Written between 1867 and 1901, the collection embraces the Romantic keyboard langage established by Mendelssohn, Chopin and Schumann, the assimilation of national idioms, and a brand of impressionism that foreshadowed Debussy (Bell Ringing, Op 54 No 6, for instance, predates Debussy’s La cathédrale engloutie by nearly two decades). The Nocturne is one of Grieg’s loveliest effusions, equally effective in its orchestrated form: the Lyric Suite (1904) consists of five of the six pieces from Op 54, omitting the Scherzo, but concluding with the above-mentioned Bell Ringing. Victor Herbert (1859–1924), one of the great names of American light music, is remembered today (if at all) for his light operettas, the most successful of which were Babes in Toyland (1903), inspired by The Wizard of Oz, and Naughty Marietta (1910) which includes the deathless ‘Ah, Sweet Mystery of Life’. In his earlier career, the Dublin-born composer had been a virtuoso cellist. Herbert’s playing of his Cello Concerto No 2 (1894) was an event which directly inspired Dvorák to write his own concerto masterpiece for the instrument. Few, though, will ever have heard Herbert’s instrumental works. Heifetz was attracted to his À la valse, recorded in the 1940s, and another violinist, Maud Powell, made a disc of another Herbert waltz—Petite Valse (originally for cello)—in 1916, the year after its composition. Otherwise little has ever been committed to disc. Here, Philip Martin unwraps a third waltz, one of Herbert’s twenty-four compositons for solo piano. La coquette – valse brillante was written in 1900, light relief after a string of ten full-length stage works written in the space of six years. It’s an attractive morceau (in A flat with a central section in C major) that makes one curious to hear others, especially the intriguingly titled La Ghazel, Marion Davies March, Get Together, On Your Way and Valse à la mode, the last three written under the pseudonym of Nobel MacClure. Zdenek Fibich (1850–1900) has rather fallen by the wayside. A precocious talent (first symphony at fourteen), he studied in Prague and then Leipzig (piano with Moscheles) before returning to his native Bohemia to conduct and compose. His more than seven hundred works were deemed original enough to rank him among the most significant of the Czech composers of his day—operas, melodramas, symphonies and symphonic poems, chamber music and about four hundred piano works. Among these are the 171 Moods, impressions and reminiscences published between 1892 and 1896. These are to Fibich what the Lyric Pieces are to Grieg. One of them, the sole piece by Fibich to be remembered, is his once-popular Poème. It travelled the world in various guises, especially popular in its arrangement for violin by Jan Kubelik (who recorded it in 1910), also appearing as a song with lyrics by one Arthur Anderson called ‘In Your Eyes’. Ede (Eduard) Poldini (born in Budapest, 1869, died in Corseaux, Switzerland, 1957) was highly regarded for his stage works, long-forgotten serious and comic operas that include The Vagabond and the Princess (1903) and The Carnival Marriage (1924, produced in London in 1926 as Love Adrift). Of a total of one hundred and fifty-six opus numbers, most are elegant salon pieces for the piano. While his Étude japonaise, Op 27 No 2 (1907), enjoyed a vogue for a time, it is for his Poupée valsante (‘Waltzing Doll’) that he is remembered now. Its popularity was enhanced by Fritz Kreisler’s violin arrangement (and two charming recordings); it was also turned into a song by the American pianist and vocal teacher Frank La Forge which Lily Pons committed to disc. The complete Marionnettes, which appears to have no opus number, was dedicated to the great conductor Arthur Nikisch. In 1896, the year of his ten Woodland Sketches, Edward MacDowell (1860–1908) was described as ‘the greatest musical genius America has produced’. Though his music was deeply rooted in the European tradition of Schumann, Mendelssohn and Liszt, MacDowell was among the first to use the melodic and rhythmic material of the American Indian, and to interpret the beauty of the American landscape. Woodland Sketches contains such descriptive tone miniatures as From an Old Indian Lodge, By a Meadow Brook, From Uncle Remus—and the delicate, justly loved gem, To a wild rose. Of all the neglected composers featured in this collection, none is less deserving of his obscurity than Joachim Raff (1822–1882). A prolific writer of mellifluous symphonies, concertos, overtures, chamber music, operas and instrumental works (two hundred and fourteen published works with many more in manuscript), Raff was highly regarded by his contemporaries, acknowledged as a major figure in the Romantic movement. He has been all but forgotten since his death, though there has been a resurgance of interest in his music in recent years with recordings of his overtures, eleven symphonies, piano concerto and two violin concertos. Raff’s Cavatina, Op 85 No 3, was a perennial favourite with violin students for many years. His other most enduring success was another short work, the delightful tone portrait of a girl at her spinning wheel. Keyed in F sharp major and with many cross-hands effects, the moto perpetuo semiquavers of La fileuse demand exceptional control. The piece was a favourite of the legendary Vladimir de Pachmann (1848–1933) who recorded the piece for the gramophone twice, in 1907 and 1909. American-born (Edgeworth, Pennsylvania), German-trained (with Franz Böhme from 1877 to 1878 and Karl Klindworth from 1884 to 1886), Ethelbert (Woodbridge) Nevin (1862–1901) had a natural facility for graceful, melodious vocal and piano music. His song The Rosary (1898) had a tremendous vogue selling six million copies in the first thirty years, netting £80,000 in royalties for the composer and his heirs. He did not live long enough to enjoy the fruits of his other big song hit Mighty Lak’ A Rose, composed in the year of his early death. But Narcissus on its own would have been sufficient to keep Nevin in life-long comfort. It comes from a set of five pieces on water themes, though whereas Nos 1, 3 and 5 (Dragon Fly, Water-Nymph and Barcarolle) are a little too nimble for amateurs, and Ophelia (No 2) is slow and insipid, Narcissus caught the mood of the time. Once you had mastered the cross-hands effects (the last page has the left hand jumping up over four octaves) and translated the harmonic progression of the middle section, the visual appeal of Narcissus and its endearing melody made it de rigeur for all drawing-room pianists. (Marie) August Durand (1830–1909) began his career as an organist, studying in his native Paris under François Benoist and holding various posts at successive churches in the city. He also occupied himself with musical criticism and composition. In 1870 he acquired with Schönewerk the music-publishing business of Flaxland. Durand & Schönewerk, then Durand & Fils (1891) and succeeded by Durand & Cie, made a speciality of publishing the works of the most important French composers, including Chausson, Debussy, Ravel and Saint-Saëns. Durand could hardly claim to number himself among this illustrious company, but all of his music found a ready publisher, including his glittering Waltz No 1 in E flat, a great favourite for many years. It is known as Durand’s Première valse—there are five others, all of them completely unknown—and is gratifyingly effective to play … until the fast repeated notes and consecutive fourths on the last page give rise (in this writer’s experience, at least) to a maddening finger jam. Nous sommes à la moitié du XIXe siècle. Le piano atteint sa majorité. L’évolution technique a permis de modifier l’instrument pour lui donner une agilité bien plus grande et une sonorité plus claire dans les aigus et plus profonde dans les graves; les cadres en fer ont été introduits, les piano à queue ainsi équipés répondent beaucoup mieux aux assauts de virtuoses exigeants. Tout aussi important, la fabrication en série fait désormais du piano droit un instrument abordable, pratique et très prisé. Entre 1850 et 1910, le nombre de pianos fabriqués, par exemple, en Grande Bretagne passera de 25 000 à 75 000. Dans le même temps, les chiffres pour l’Amérique seront de 900 à un époustouflant 360 000. Pour le gentleman amateur et la jeune fille de bonne famille, les œuvres «sérieuses» les plus populaires, à en juger par les recueils bon marché de l’époque, sont celles qui présentent les mélodies les plus larges et produisent le plus grand effet. Parmi les favoris: mouvements des Sonates de Beethoven, Nocturnes de Chopin (dans un registre plus simple), les Chansons sans paroles de Mendelssohn, les morceaux courts de Schumann et les Impromptus les moins difficiles de Schubert. Pour satisfaire aux besoins grandissants de cette nouvelle «classe» d’exécutants mélomanes, une toute nouvelle école de compositeurs voit le jour, qui prend pour modèle les romantiques d’Europe continentale, et qui vient se positionner à mi-chemin entre les grands compositeurs et les revendeurs de chair à canon pianistique bon marché. Dans les années 1850, la musique tendra à refléter les préoccupations de l’époque, comme la mort et une religion sentimentalisée; dans les années 1890, le mouvement embrassera une musique beaucoup plus légère se prenant moins au sérieux. C’est la musique de cette ère ignorant encore le gramophone et la TSF, conservée bien au chaud dans les tabourets de piano des demeures européennes et américaines que nous ressuscitons et, oui, que nous célébrons dans cette collection. Tous les morceaux que nous présentons ne sont pas faciles à jouer d’un point de vue technique; d’aucuns donnent même quelque fil musical et artistique à retordre; tous ne sont pas de la grande musique (l’adoption d’un tel critère tomberait à côté de notre but); certains sont plus anciens (Haendel, Beethoven et Paradies). Mais quels que soient sa provenance ou son mérite musical, la musique de cette collection s’entend peu dans les salles de concert aujourd’hui. Malheureusement, peu de professionnels se risqueraient à mettre au programme une pièce telle que la charmante Mélodie en fa de Rubinstein, du fait de ses associations. Et pourtant, certaines de ces compositions figurent parmi les plus populaires jamais écrites pour le piano. Cette distinction, quelque soit son mérite, doit être mise à l’honneur. Et bravo, Philip Martin, d’avoir farfouillé dans toutes ces boîtes à la recherche d’une musique de deuxième main, d’avoir réparé les pages écornées et déchirées, pour nous permettre d’entendre cette musique que nos grands-parents et nos arrières-grands-parents aimaient tant. Cent ans (ou presque) plus tard, et nous partageons peut-être encore leur plaisir. À l’instar de ses pairs dans cette collection, Christian Sinding (1856–1941) fait place à l’histoire au sens large et son œuvre n’est commémorée que par quelques brèves minutes qui lui sont empruntées. Sur les cent trente-deux œuvres qu’il a composées, toutes ses symphonies, ses opéras et sa musique de chambre ont disparu, bien que sa magistrale Suite en la mineur pour violon sorte encore parfois des tiroirs. N’est-ce pas souvent le cas, pourtant, comme on le voit dans cette anthologie, que sur l’œuvre de toute une vie, un morceau, un seul, fait la renommée internationale impérissable d’un compositeur? Frühlingsrauschen (Murmures du Printemps) était la quintessence des morceaux «de tabourets de piano» bien que ses cinq bémols et ses traits chromatiques rapides auront sûrement causé bien des frayeurs aux pianistes amateurs. C’est nous qui perdons à ne pas entendre cette petite perle d’inspiration dans les salles de concert de nos jours; elle est considérée comme étant trop galvaudée. Doit-on rejeter sans jugement The Maiden’s Prayer, ce «produit démodé et inepte» (Arthur Loesser) devenu synonyme de blague sentimentale de salon? C’est ce que fait la plupart des gens. Mais ce morceau a maintenant dépassé la parodie. Le titre «Maiden’s Prayer» est encore plus connu dans les pays anglo-saxons que la musique qu’il incarne, musique que plus personne ne joue, pas mêmes les amateurs fleur bleue qui adoraient ses «arpèges dégoulinants et larmoyants». Très peu de gens sont en mesure de vous dire le nom du compositeur. Voilà un morceau qui n’a pas de thème facile à retenir ou à fredonner. Ses arpèges brisés ne sont même pas faciles à interpréter correctement et ses quatre variations (si l’on peut toutefois les qualifier de variations) sont dénuées de tout intérêt musical. Et pourtant, The Maiden’s Prayer est probablement le morceau pour piano qui s’est le plus vendu dans le monde. Plus de cent éditions furent publiées au XIXe siècle et en 1924, plus de soixante ans après sa première apparition, un éditeur de musique australien admit en vendre dix mille exemplaires par an. En dépit du statut unique de ce morceau, on sait très peu de choses de la courte vie de sa compositrice polonaise. Tekla Badarzewska (1834–1861) composa ce morceau alors qu’elle avait tout juste dix-sept ans et le fit publier en 1851 à Varsovie, sous le titre Molitwa dziewicy («Prière de la jeune fille»). Le morceau fut publié à nouveau en tant que supplément à la Revue et Gazette Musicale de Paris en 1859 et à partir de là, il se répandit comme la peste. On compte trente-quatre autres morceaux pour piano de Badarzewska, y compris une composition intitulée Prayer Answered. Heureusement, elle n’a pas réussi à capturer l’imagination du public. Un critique allemand peu galant écrira, dans la rubrique nécrologique de Badarzewska, que «son décès prématuré sauva le monde de la musique d’une véritable inondation d’intolérables sanglots larmoyants». De bien plus grands compositeurs que Badarzewska brilleront et réussiront à l’échelle mondiale avant de sombrer dans l’obscurité. Pour le meilleur ou pour le pire, The Maiden’s Prayer, à défaut du nom de la compositrice, ne tombera jamais aux oubliettes. Quelque chose tout de même pour une jeune compositrice polonaise en herbe des années 1850! Difficile à ignorer en fait. L’histoire raconte que le grand violoniste Fritz Kreisler visita Antonín Dvorák (1841–1904), malade, en 1903, et reçut une pile de partitions (pour la plupart des œuvres inconnues). Parmi ces morceaux se trouvaient huit Humoresques pour piano seul, composées en août 1894 et publiées l’automne suivant par Simrock à Berlin. Le violoniste se prit d’affection pour le no7, l’Humoresque en sol bémol, et bien que Dvorák voulût le morceau comme un caprice léger et saugrenu, Kreisler l’arrangea et le transforma en une composition plus lente et sentimentale. Ses quatre enregistrements et interprétations de «L’Humoresque de Dvorák» font de l’œuvre un morceau universellement populaire et l’objet d’arrangements successifs pour toutes les combinaisons possibles et imaginables d’instruments: Kreisler effectuera même le premier enregistrement pour piano en 1914. On n’entend que très rarement les sept autres Humoresques de Dvorák. Selim Palmgren (1878–1951) a été qualifié de «compositeur très inégal, Vielschreiber typique, alimentant inlassablement les presses des éditeurs». Mais parmi ses miniatures pour piano, on rencontre des joyaux merveilleusement exécutés. Les mordus du piano adorent les deux morceaux rendus célèbres par Benno Moiseiwitsch (Refrain de berceau et West Finnish Dance) et la distrayante galopade d’Eileen Joyce (En route). Kevätyö ou Nuit de mai est certainement l’un des poèmes musicaux les plus délicatement ouvragés que Palmgren ait composé. Il provient de sa collection de sept morceaux, intitulée Spring, et s’avère typique de l’écriture d’ambiance du compositeur finlandais, avec ses harmonies impressionnistes aux teintes scandinaves, cousin germain de certaines Pièces lyriques pour piano de Grieg. «Après Chopin, écrivait Paderewski, Moritz Moszkowski (1854–1925) comprend le mieux l’écriture pour le piano, et cette écriture embrasse toute la gamme des techniques pianistiques.» Aujourd’hui, on regarde sans doute cette affirmation d’un air soupçonneux, mais Paderewski n’était pas loin de la vérité. La musique de Moszkowski pour piano, fluide, gracieuse, mélodieuse et délicatement composée s’écoule limpidement sous les doigts de l’interprète. Certes, personne ne pourrait prétendre qu’il s’agisse ici d’une musique profonde, mais comme l’écrivait quelqu’un, «à défaut d’exciter l’intellect, elle fait battre le cœur». La musique de Moszkowski figurait au répertoire de nombreux pianistes de renom, dont Hofmann qui étudia avec Moszkowski et se vit dédier le concerto pour piano de ce dernier, Godowsky, Bauer, Lhevinne, Rachmaninov, Friedman (qui enregistra la Sérénade), Horowitz et Cherkassky. Même sans ses origines fortunées, Moszkowski aurait vécu confortablement sur le succès de ses Danses espagnoles, op. 12 (pour deux pianos) et de la Sérénade. La mélodie cadencée de cette Sérénade attira l’attention des paroliers: Nathan H. Dole écrivit l’affreux «I wait beneath thy window, love» («J’attends sous ta fenêtre, mon amour») enregistré en 1915 par Fritz Kreisler et John McCormack, tandis qu’une interprétation allemande plus sensible de la mélodie, «Liebe kleine Nachtigall» («Cher petit rossignol») attira les talents de Richard Tauber (1935) et de Miliza Korjus (1936). Peu de pianistes auront rivalisé de célébrité avec Ignacy Jan Paderewski (1860–1941). Pendant des décennies, son nom fut synonyme de son instrument. Bien que de nombreux virtuoses l’aient depuis dépassé (et de loin) techniquement et que ses enregistrements trahissent une liberté très romantique par rapport au texte écrit, Paderewski exerçait une réelle fascination sur son public, qui frisait le magnétisme. En tant que compositeur, rares seront les œuvres qui lui survivront—son opéra Manru jouira d’un bref succès, à l’instar de son Concerto pour piano—mais en termes de popularité, rien de ce qu’il écrira n’arrivera à la cheville de son Menuet en sol (il existe un autre menuet de Paderewski en la majeur, No7 des Miscellanea, op. 16, mais celui-ci, en sol majeur, est le «Menuet de Paderewski»). Dans ses mémoires, le compositeur décrit avec jubilation comment ce morceau fut composé comme une plaisanterie. Alors qu’il séjournait à Varsovie, il jouait souvent Mozart à deux amis âgés. Ayant épuisé tout son répertoire de Mozart, Paderewski décida de composer un morceau dans le style du maître et de le jouer à ses amis pour voir s’ils s’en apercevraient. Ayant entendu le morceau à demi improvisé (sans les cadences qui seraient ajoutées ultérieurement), les amis de Paderewski refusèrent de croire qu’il ne fût pas composé par Mozart, et encore moins qu’il fût composé par le pianiste (de toute évidence, les références à Schubert dans le Menuet leur échappèrent). Les amis pardonnèrent le canular et insistèrent par la suite que le compositeur joua son Menuet dès qu’il leur rendrait visite, requête qui poursuivra Paderewski pour le restant de sa longue carrière. La première performance sera donnée par Anna Essipoff (1851–1914), l’épouse du professeur de Paderewski, Theodor Leschetizky, et c’est grâce à son soutien que le morceau de ce Polonais encore inconnu deviendra célèbre. Paderewski lui-même enregistrera son Menuet six fois sur gramophone, en 1911, 1917, 1922–23 (deux prises différentes apparaissent sur HMV DB379), 1926 et 1937. L’harmonieux forgeron est le quatrième et dernier mouvement de la cinquième suite pour clavecin de George Frideric Haendel (1685–1759) provenant du premier volume de ses  Suites de Pièces pour le Clavecin publié à Londres en 1720. La musique fut composée dès sa première année à Londres, en 1710, ou elle lui fut peut-être apportée du continent: un passage de l’Almira de Haendel, écrit en 1704, ressemble beaucoup à L’harmonieux forgeron; une bourrée de Richard Jones (1680–1740) met apparemment en scène un air presque identique dans un ton mineur, bien qu’il ne soit pas clairement établi si Jones précéda Haendel ou si ce fut le contraire. Ce qui est certain, c’est que l’Air et les Variations n’ont rien à voir avec un forgeron, harmonieux ou pas. L’histoire fictive selon laquelle Haendel aurait entendu la mélodie pour la première fois de la bouche d’un forgeron d’Edgware (Londres) alors qu’il se réfugiait dans la forge pour se protéger d’un orage fut propagée par l’antiquaire célèbre pour ses anecdotes Richard Clark (1780–1856) dans ses Reminiscences of Handel (1836). La véritable origine du surnom de ce morceau provient plus probablement d’un revendeur de musique de la ville de Bath, nommé Lintern, qui après avoir été forgeron se tourna vers la musique. On lui demandait toujours de jouer L’Air et Variations et il décida de publier le premier mouvement lui-même en l’intitulant «L’harmonieux forgeron». Aucun exemplaire de l’édition de Lintern ne verra cependant le jour. La version la plus ancienne de la musique porte la date de 1819 et est arrangée en duo. On recense sept collections de pièces courtes par Pyotr Tchaïkovski (1840–1893) portant le nom «Morceaux». Les premiers morceaux de choix apparaissent dès 1870, et le dernier en 1893, soit un total de cinquante-trois. L’opus 40 consiste, en majeure partie en différents mouvements de danses et de chansons sans paroles de «difficulté moyenne» pour les enfants. Les morceaux les plus célèbres sont les deux valses à la Chopin (No8 en la bémol, que Rachmaninov estimait assez pour l’enregistrer et la triste No9 en fa dièse mineur). La Chanson triste (en sol mineur) voit un Tchaïkovski on ne peut plus sobre et émouvant, son thème d’ouverture obsédant (la melodia est marquée comme devant être jouée con molto espressione) faisant place à une section centrale comme animée à regret, avant de revenir au sujet d’une résignation tranquille. Le grand Benno Moiseiwitsch l’enregistrera en 1945. Bien que Jean (Julius Christian) Sibelius (1865–1957) commença les leçons de piano à l’âge de huit ans (abandonnant toutefois rapidement pour le violon) et étudia avec Busoni à Helsinki, le piano ne fut pas son principal moyen d’expression. Ses œuvres orchestrales, vocales et de scène éclipsent presque totalement le reste de ses compositions; aussi est-il surprenant de découvrir que Sibelius composa cent trente-quatre pièces différentes pour le piano, sous trente-cinq opus différents. Peu d’entre elles peuvent être considérées comme représentatives du sommet de son art et seules sa célèbre Valse triste, op. 44 No1 (arrangement de l’original composé pour l’orchestre) et sa Romance en ré bémol, op. 24 No9 deviendront vraiment populaires. Philip Martin nous convainc toutefois parfaitement de la valeur de cet Épicéa (Kuusi), sobre esquisse d’une mélancolie émouvante et, d’aucuns diraient, typiquement songeuse. Différents membres de la famille Mason occupèrent une place proéminente dans le monde musical américain pendant cent cinquante ans. Lowell Mason (1792–1872) était compositeur, organiste, chef d’orchestre, professeur de musique de premier plan et l’un des premiers et plus grands promoteurs du chant choral de son pays; son fils, Luther Whiting Mason (1828–1896) était un professeur de musique notoire qui, en 1857, publia un Book of Chants pour le chant communautaire avec Dwight Hamilton Baldwin, qui deviendrait le fondateur de la maison Baldwin (facteur de pianos); le frère de Luther, Henry, fut le cofondateur, avec Emmons Hamlin, de la manufacture de pianos Mason & Hamlin; Le fils d’Henry était Daniel Gregory Mason (1873–1953), qui devint un éminent compositeur et professeur. Mais c’est William Mason (1829–1908), cadet de Lowell Mason, qui nous intéresse ici: un professeur et concertiste célébré. Il étudia avec Moscheles à Leipzig, Dreyschock à Prague et Liszt à Weimar, et revint aux États-Unis en 1854. On pense que la tournée de Mason en 1855 fut la toute première d’Amérique exclusivement consacrée aux récitals pour piano (programme sans artistes «assistants»). Fatigué de sa vie itinérante, il finira par s’installer à New York et s’établira comme professeur et interprète de musique de chambre. Difficile à oublier et très efficace (c’est-à-dire pas trop difficile à jouer) la Tarantelle en la mineur est la première des dix Danses de salon de Pieczonka, qui incluent les chopinesques Mazurka de concert, Valse en la bémol et Grande polonaise héroïque, ainsi que la perspective plus tentante de la Danse des fantômes, Wanda – mazurka brillante et Salon-walzer über Namen «BACH». Très certainement polonais, peut-être d’origine de Silésie, Albert (ou était-ce Alfred?) Pieczonka (1828–1912) est un personnage insaisissable. Malgré ses recherches mondiales assidues, l’auteur de ces lignes n’a pu déterrer aucun détail biographique sur le compositeur. Le mensuel populaire The Etude qui servit les professeurs de musique américains pendant soixante-cinq ans (1883–1948) dédiait tout son numéro de février 1915 (Vol. 33 No2) à la musique polonaise. À la page 128 est mentionné Hommage à la Pologne – mazurka (l’une des Danses de salon) de A. Pieczonka, et bien que le répertoire des compositeurs polonais figure à ce numéro de février, le magazine évite de mentionner son nom. Probablement au tournant du siècle, plus de quarante œuvres au total seront publiées par différents éditeurs aux États-Unis et à l’étranger (y compris par Schirmer, John Church, Augener et bien d’autres). Les soixante-six pièces pour piano qu’Edvard Grieg (1843–1907) rassemblera en dix volumes sous le titre Pièces lyriques montre le meilleur du compositeur norvégien, maître de la miniature, peintre des tonalités. Écrite entre 1867 et 1901, cette collection embrasse le langage romantique pour le piano établi par Mendelssohn, Chopin et Schumann, l’assimilation des idiomes nationaux et présente une marque impressionniste distincte en prélude à Debussy (Sonnerie de cloches, op. 54 No6, par exemple, laisse présager de La cathédrale engloutie de Debussy, près de vingt ans avant qu’elle ne soit composée). Le Nocturne est l’une des plus charmantes effusions de Grieg, tout aussi efficace dans sa forme pour orchestre: la Suite lyrique (1904) consiste en cinq des six pièces de l’opus 54, et omet le Scherzo mais se conclut sur la Sonnerie de cloches mentionnée plus haut. Victor Herbert (1859–1924), grand nom de la musique légère américaine, est connu aujourd’hui (si tant est qu’il le soit) pour ses opérettes dont les plus populaires sont Babes in Toyland (1903), inspirée par Le Magicien d’Oz, et Naughty Marietta (1910) qui contient l’impérissable «Ah, Sweet Mystery of Life». Au début de sa carrière, le compositeur né à Dublin est violoncelliste virtuose. Lorsqu’il jouera son Concerto pour violoncelle No2 (1894), l’événement inspirera directement Dvorák et le poussera à écrire son propre chef-d’œuvre pour cet instrument. Rares sont ceux qui toutefois auront entendu les œuvres instrumentales d’Herbert. Heifetz était attiré par À la valse, enregistré dans les années 1940, et Maud Powell, violoniste elle aussi, enregistra une autre des valses du compositeur, Petite Valse (composée à l’origine pour le violoncelle) en 1916, année suivant sa composition. À part cela, pas grand chose n’a été enregistré. Ici, Philip Martin dévoile une troisième valse, l’une des vingt-quatre compositions d’Herbert pour piano seul. La coquette – valse brillante, fut écrite en 1900, brève parenthèse après une série de dix pièces intégrales pour la scène composées en l’espace de six ans. Il s’agit d’un morceau très attrayant (en la bémol avec une partie centrale en do majeur) qui aiguise la curiosité: on veut en entendre d’autres, particulièrement celui au titre fascinant, La Ghazel, et puis Marion Davies March, Get Together, On Your Way et Valse à la mode, ces trois derniers écrits sous le pseudonyme de Nobel MacClure. Zdenek Fibich (1850–1900) est quelque peu tombé aux oubliettes. Talent précoce (première symphonie à 14 ans), il étudia le piano à Prague puis à Leipzig avec Moscheles avant de retourner à sa Bohême natale pour diriger et composer. Ses œuvres qui se montent à plus de sept cent étaient considérées comme suffisamment originales pour le faire figurer parmi les plus importants compositeurs tchèques de son époque: opéras, mélodrames, symphonies et poèmes symphoniques, musique de chambre et quelque quatre cent œuvres pour piano. Parmi celles-ci figurent les 171 Moods, impressions and reminiscences publiées entre 1892 et 1896. Elles sont à Fibich ce que les Pièces lyriques sont à Grieg. L’une d’entre elles, unique morceau de Fibich dont on se souvient, est son Poème autrefois célèbre. Il a traversé le monde sous différents aspects et fut très populaire sous la forme de son arrangement pour violon par Jan Kubelik (qui l’enregistra en 1910). Il apparaît aussi sous forme de chanson, «In Your Eyes» dont les paroles furent écrites par un certain Arthur Anderson. Ede (Eduard) Poldini (né à Budapest, 1869, et décédé à Corseaux, en Suisse, 1957) était considéré avec beaucoup d’admiration pour ses œuvres de scène, opéras dramatiques et comiques depuis longtemps oubliés, comme Le Vagabond et la Princesse (1903) et Le Mariage Carnaval (1924, produit à Londres en 1926 sous le titre Love Adrift). Sur un total de cent cinquante-six opus, la plupart des œuvres sont d’élégantes pièces pour piano de salon. Alors que son Étude japonaise op. 27 No2 (1907) fut en vogue pendant un temps, c’est pour sa Poupée valsante qu’il est aujourd’hui connu. La popularité de cette pièce sera renforcée par l’arrangement pour violon de Fritz Kreisler (et deux charmants enregistrements); elle deviendra aussi chanson sous la plume du pianiste américain et professeur de chant Frank La Forge et de la voix de Lily Pons qui l’enregistrera sur disque. Le recueil complet des Marionnettes, qui semble ne porter aucun opus, sera dédicacé au grand chef d’orchestre Arthur Nikisch. En 1896, lorsqu’il composa ses dix Woodland Sketches, Edward MacDowell (1860–1908) fut décrit comme «le plus grand génie musical jamais produit par l’Amérique». Bien que sa musique fût profondément enracinée dans la tradition européenne de Schumann, Mendelssohn et Liszt, MacDowell fut parmi les premiers à utiliser les sources mélodiques et rythmiques des Indiens d’Amérique, et à interpréter la beauté des paysages de son continent. Woodland Sketches contient de superbes miniatures descriptives telles que From an Old Indian Lodge, By a Meadow Brook, From Uncle Remus et le petit joyau délicat, To a wild rose, apprécié à fort juste titre. De tous les compositeurs négligés de cette collection, aucun ne mérite moins l’obscurité que Joachim Raff (1822–1882). Compositeur prolifique d’œuvres mélodieuses (symphonies, concertos, ouvertures, musique de chambre, opéras et œuvres instrumentales—deux cent quatorze œuvres publiées et bien plus encore manuscrites), Raff était considéré par ses contemporains comme une figure proéminente du mouvement romantique. Il tomba presque dans l’oubli après sa mort, mais on voit un regain d’intérêt pour sa musique ces dernières années avec les enregistrements de ses ouvertures, onze symphonies, concerto pour piano et deux concertos pour violon. La Cavatina, op. 85 No3, fut une grande favorite des jeunes violonistes pendant de nombreuses années. Autre succès particulièrement durable, La fileuse est une œuvre assez courte qui peint le portrait charmant d’une jeune fille à la quenouille. Composée en fa dièse majeur et pleine d’effets de mains croisées, la pièce présente le défi de doubles croches en moto perpetuo qui demandent une maîtrise exceptionnelle. L’œuvre était une favorite du légendaire Vladimir de Pachmann (1848–1933) qui l’enregistra deux fois pour le gramophone, en 1907 et 1909. Né en Amérique (à Edgeworth en Pennsylvanie) et élève de maîtres allemands (Franz Böhme de 1877 à 1878 et Karl Klindworth de 1884 à 1886), Ethelbert (Woodbridge) Nevin (1862–1901) a dès le départ un talent naturel pour la musique vocale et pour piano, gracieuse et mélodieuse. Sa chanson, The Rosary (1898) sera très en vogue et se vendra à six millions d’exemplaires les trente premières années, produisant ainsi quelque 110 000 euros de royalties pour le compositeur et ses héritiers. Il ne vivra cependant pas assez longtemps pour profiter de la fortune produite par son autre chanson très célèbre, Mighty Lak’ A Rose, composée l’année de sa mort prématurée. Narcissus en soi aurait pu faire vivre Nevin confortablement toute sa vie. Le morceau provient d’un recueil de cinq pièces sur le thème de l’eau, mais à la différence des Nos1, 3 et 5 (Dragon Fly, Water-Nymph et Barcarolle) trop exigeants pour l’amateur, et Ophelia (No2) lent et insipide, Narcissus s’inscrit exactement dans l’air du temps. Une fois maîtrisé l’effet des mains croisées (la dernière page voit la main gauche sauter de quatre octaves vers le haut du piano) et traduite la progression harmonique de la partie centrale, l’attrait visuel de Narcissus et sa mélodie attachante en font un morceau de rigueur pour tous les pianistes de salon. (Marie) Auguste Durand (1830–1909) commença sa carrière comme organiste, alors qu’il étudiait à Paris, sa ville natale, avec François Benoist et qu’il occupait divers postes dans différentes églises de la capitale. Il se consacra aussi à la critique et à la composition musicale. En 1870, il acquit avec Schönewerk la maison d’édition musicale Flaxland. Durand & Schönewerk, puis Durand & Fils (1891) firent place à Durand & Cie. L’éditeur se spécialisera dans la publication des œuvres des plus grands compositeurs français, y compris Chausson, Debussy, Ravel et Saint-Saëns. Durand aura des difficultés à se compter lui-même au sein de ce groupe prestigieux, mais toute sa musique sera accueillie par les éditeurs, y compris sa Valse No1 en mi bémol, éclatante et grande favorite des tabourets de piano pendant de longues années. Elle est connue comme la Première valse de Durand. Il en existe cinq autres, toutes totalement inconnues, et elle est à la fois gratifiante et impressionnante à jouer … jusqu’à ce que les doigts ne s’emberlificotent (en tous cas de l’expérience de l’auteur de ces lignes) dans les notes rapides répétées et les quartes consécutives de la dernière page. Gegen Mitte des 19. Jahrhunderts war der Klavierbau zur Reife gelangt. Entscheidende technische Entwicklungen am Instrument erlaubten größere Beweglichkeit und lieferten einen leuchtenderen Ton. Man hatte den Metallrahmen im Flügel eingeführt und damit ein widerstandsfähiges Instrument geschaffen, das selbst den stärksten Angriffen erbarmungsloser Virtuosen standhalten konnte. Einen ebenso wichtigen Einfluss übte die Massenproduktion des aufrecht stehenden Klaviers aus, durch die der Erwerb eines solchen Instruments plötzlich für viele finanziell möglich, einfach zu realisieren und äußerst begehrt wurde. Zwischen 1850 und 1910 stieg die Anzahl der hergestellten Klaviere in Großbritannien von 25 000 auf 75 000. In der gleichen Zeitspanne stieg die Zahl in Amerika von 900 auf erstaunliche 360 000. Wie den billigen Klavieralben jener Zeit zu entnehmen ist, bevorzugten die Amateurmusiker und jungen Damen höherer Schule anscheinend jene Werke aus dem „ernsten“ Repertoire, die die ausschweifendsten Melodien und größten Effekte enthielten. Sätze aus Beethovens Sonaten, die leichteren Nocturnes von Chopin, Mendelssohns Lieder ohne Worte, kurze Stücke von Schumann und die einfacheren Impromptus von Schubert tauchten immer wieder auf. Um dieser neuen Klasse ausübender Musikliebhaber gerecht zu werden, tauchte eine ganze Schar von Komponisten auf, die in Anlehnung an romantische Modelle ganz pragmatisch eine Stellung zwischen den Großen Komponisten und den Hausierern billigen Klavierfutters einnahmen. In den 1850iger Jahren pflegte die von ihnen geschriebene Musik die herrschende Faszination mit Tod und einer ins Sentimentale gewendeten Religion widerzuspiegeln. Bis zu den 1890iger Jahren hatte der Themenkreis eine Erweiterung erfahren und man schrieb zunehmend Musik von leichterem Gepräge, die sich weniger ernst nahm. In jenem Zeitalter vor dem Grammophon und Radio vor ungefähr hundert Jahren lagerten in jedem europäischen und amerikanischen Klavierstuhl Notenexemplare von—also, der Art von Musik, die in dieser Einspielung der Vergessenheit entrissen und, zugegeben, gefeiert wird. Nicht alle Stücke sind vom pianistisch-technischen Standpunkt her leicht zu spielen, manche von ihnen stellen sogar die größten musikalischen und interpretatorischen Anforderungen. Auch sind nicht alle Stücke gute Musik (dies zum Auswahlkriterium zu erheben, würde die Absicht verfehlen). Einige (die Stücke von Händel, Beethoven und Paradies) stammen natürlich aus einer früheren Epoche. Aber was immer auch ihre Herkunft oder ihr musikalischer Verdienst sei, nur wenige Stücke auf dieser CD sind heutzutage im Konzertsaal zu hören. Bedauerlicherweise wagen sich nur wenige gestandene Pianisten, selbst ein solch nettes Stück wie Rubinsteins Melodie in F ins Konzertprogramm aufzunehmen. Man fürchtet seine Assoziationen. Und doch gehören einige dieser Klavierkompositionen zu den beliebtesten Werken, die jemals für das Instrument geschrieben wurden. Diese Eigenschaft sollte unabhängig von dem Grund dieser Beliebtheit gewürdigt werden. Und bravo, Philip Martin, für das Stöbern in all den Kartons von gebrauchten Noten, für das Instandsetzen ihrer schnuddeligen, eingerissenen und abgegriffenen Seiten, damit wir wieder jene Musik zu Gehör bekommen, die unseren Großeltern und Urgroßeltern so viel Vergnügen bereitet hatte. Noch ein Jahrhundert oder so, und wir teilen vielleicht wieder ihre Freude. Wie so viele seiner Kollegen auf dieser CD musste sich Christian Sinding (1856–1941) dem Lauf der Geschichte fügen. Man erinnert sich seiner nur aufgrund ein paar kurzer Minuten aus seinem gesamten Lebenswerk. Von den 132 verschiedenen Werken sind alle Sinfonien, Opern und seine gesamte Kammermusik verschwunden. Allerdings wird seine meisterhafte Suite in a-Moll für Violine gelegentlich gespielt. Und genau wie bei anderen Stücken auf der hier vorliegenden Einspielung ist es ein einzelnes Stück aus einer Sammlung, das dem Komponisten seinen anhaltenden internationalen Ruhm bescherte. Frühlingsrauschen gehörte zur Grundausrüstung jedes Klavierstuhls, auch wenn sich seine fünf bs und schnellen chromatischen Läufe für viele ehrgeizigen Amateure doch als ziemlich gefährlich herausgestellt haben mussten. Es ist sicher ein Verlust für uns, dass solch eine interessante Miniatur als zu abgedroschen angesehen wird, um heutzutage in Konzerten vorgestellt zu werden. Sollten wir Das Gebet einer Jungfrau, „dieses ordinäre Produkt von Stümperhaftigkeit“ (Arthur Loesser) kurzerhand abschreiben, das mittlerweile mit sentimentalem Salonramsch gleichgesetzt und der Lächerlichkeit preisgegeben wird? Die meisten halten es so. Das Stück ist nun allerdings jenseits der Parodie, sein Titel ist bekannter als seine Musik, da es von niemandem mehr gespielt wird, nicht einmal von jenem empfindsamen Amateur, für den es ursprünglich gedacht war und der sich in seinen „tropfenden, rührseligen Arpeggios“ so hingebungsvoll ergehen konnte. Nur wenige sind in der Lage, sich an den Namen seiner Komponistin zu erinnern. Aber Vorsicht! Auch wenn Das Gebet einer Jungfrau keine einprägsame Melodie zum Singen oder Summen hat, die Oktavarpeggios nicht leicht richtig auszuführen sind und seine vier „Variationen“ (wenn man sie mit so einer Bezeichnung würdigen kann) jeglichen musikalischen Interesses entbehren, ist es wahrscheinlich das meist verkaufte Klavierstück, das jemals geschrieben wurde. Über 100 Ausgaben wurden im 19. Jahrhundert veröffentlicht und 1924, mehr als 60 Jahre nach seiner Erstveröffentlichung, gab ein Verleger aus Melbourne zu, 10 000 Exemplare pro Jahr umgesetzt zu haben. Trotz seines einzigartigen Status weiß man wenig über das kurze Leben seiner polnischen Komponistin. Tekla Badarzewska (1834–1861) komponierte Das Gebet im Alter von nur 17 Jahren. Verlegt wurde es 1851 in Warschau als Molitwa dziewicy („Das Gebet einer Jungfrau“). Es wurde 1859 in der Notenbeilage zur Pariser Revue et Gazette Musicale veröffentlicht, und verbreitete sich seitdem in Windeseile in der ganzen Welt. Es gibt weitere 34 Klavierstücke von Badarzewska, zu denen eins mit dem Titel Die Antwort auf das Gebet gehört. Es ist nicht schlechter als Das Gebet einer Jungfrau—das geht gar nicht—aber zum Glück gelang es ihm nicht, ein Publikum für sich zu begeistern. Ein grober deutscher Journalist ließ sich in seinem Nachruf für Badarzewska zur Äußerung hinreißen, dass ihr „früher Tod, die Musikwelt von reinster Überschwemmung mit unerträglicher Rührseligkeit“ bewahrt habe. Weitaus bessere Komponisten als Badarzewska leuchteten hell und profitabel in der Welt, bevor sie der Vergessenheit anheim fielen. Ob nun zum Guten oder Schlechten, Das Gebet der Jungfrau wird niemals vergessen werden, wenn auch nicht der Name seiner Komponistin. Eine ganz erstaunliche Leistung für eine 17jährige polnische Komponistin aus den 1850iger Jahren. Die Tatsache lässt sich nicht vom Tisch wischen. Man erzählt sich, der berühmte Violinist Fritz Kreisler habe den kranken Antonín Dvorák (1841–1904) 1903 besucht und dabei einen Stoß (im Großen und Ganzen unbekannter) Musik überreicht bekommen. Darunter befand sich eine Sammlung von acht Humoresken für Klavier solo, die im August 1894 komponiert und im Herbst desselben Jahres bei Simrock in Berlin veröffentlicht worden waren. Nr. 7 (Humoreske in Ges) aus dieser Sammlung gefiel dem Violinisten besonders gut, und mit seiner Bearbeitung für Violine verwandelte er das Stück von einem von Dvorák beabsichtigten leichtherzigen, eigenwilligen Capriccio zu einem langsameren, sentimentalen Stück. Kreislers (vier) Einspielungen und zahlreichen Aufführungen von Dvoráks Humoreske führten zur umfassenden Verbreitung des Stückes und darauffolgend zu Bearbeitungen für jede nur erdenkliche Kombination von Instrumenten (Kreisler nahm 1914 sogar die originale Klavierfassung auf). Die restlichen sieben Humoresken sind fast niemals zu hören. Selim Palmgren (1878–1951) wurde als ein „qualitativ sehr unausgeglichener Komponist“, beschrieben, „ … ein typischer Vielschreiber, der unermüdlich Material für den Rachen des Verlegers liefert“. Aber unter seinen Klavierminiaturen begegnet man vielen wunderbar geschliffenen Juwelen. Kenner des Klaviers lieben die zwei von Benno Moiseiwitsch gerühmten Nummern (Refrain de berceau und Westfinnischer Tanz), und Eileen Joyces unterhaltsame Eskapade durch En route. Kevätyö—Maiennacht (oder Nacht im Mai, wie es in manchen Ausgaben heißt)—ist sicherlich eines der besten von Palmgrens fein gearbeiteten Tongedichten. Es kommt aus seiner Sammlung von sieben Stücken mit dem Titel Frühling und ist für den atmosphärischen Kompositionsstil des finnischen Komponisten und seine impressionistischen, in skandinavischen Farben getränkten Harmonien typisch. Diese Sammlung steht Griegs Lyriske stykker („Lyrischen Stücken“) sehr nahe. „Nach Chopin“, schrieb Paderewski, „versteht Moritz Moszkowski (1854–1925) am besten, wie man für das Klavier schreibt, und seine Kompositionen enthalten das gesamte Spektrum verschiedener pianistischer Techniken.“ Man mag über diese Äußerung heutzutage vielleicht die Nase rümpfen, aber Paderewski hatte so unrecht nicht. Moszkowskis sorglose, anmutige, melodische und wohl gearbeitete Klaviermusik liegt wunderbar unter den Händen. Niemand könnte so tun, als sei das tiefgründige Musik, aber „selbst wenn sie den Intellekt nicht anregt“, wie da einer schrieb, „so lässt sie doch den Puls höher schlagen“. Moszkowskis Musik befand sich im Repertoire vieler berühmter Pianisten, unter ihnen auch Hofmann—der bei Moszkowski studierte und dem das späte Klavierkonzert seines Lehrers gewidmet sind—Godowsky, Bauer, Lhevinne, Rachmaninow, Friedman (die die Serenata einspielte), Horowitz und Cherkassky. Selbst ohne seinen wohlhabenden Hintergrund hätte Moszkowski bequem von den frühen Erfolgen seiner Spanischen Tänze, Op. 12 (für Klavierduett) und Serenata leben können. Die beschwingte Melodie der Serenata zog die Aufmerksamkeit von Dichtern auf sich: ein gewisser Nathan H. Dole schrieb das schreckliche „I wait beneath thy window, love“ („Ich warte unter deinem Fenster, Liebling“, das 1915 von Fritz Kreisler und John McCormack aufgenommen wurde), wohingegen die etwas passendere deutsche Vertextung der Melodie, „Liebe kleine Nachtigall“ das Talent eines Richard Taubers (1935) und Miliza Korjus’s (1936) in Anspruch nahm. Wenige Pianisten haben es Ignacy Jan Paderewski (1860–1941) an Berühmtheit gleichgetan. Jahrzehntelang stand sein Name synonym für sein Instrument. Obwohl viele Virtuosen damals wie heute über eine bessere Technik verfügen, und auch wenn Paderewskis Aufnahmen eine dem Romantiker eigene Freiheit bei der Umsetzung des Notentextes verraten, übte der Pianist eine Faszination auf sein Publikum aus, die ans Rätselhafte grenzt. Wenige seiner eigenen Kompositionen sind uns überliefert—seine Oper Manru erfreute sich eines kurzen Erfolges wie auch sein Klavierkonzert—aber keines seiner Werke konnte dem Erfolg seines Menuetts in G auch nur annähernd das Wasser reichen (es gibt noch ein anderes Menuett von Paderewski—in A-Dur, Nr. 7 aus den Miscellanea, Op. 16—aber das hier eingespielte Stück ist das „Paderewski-Menuett“). In seinen Memoiren erinnert sich der Komponist mit einem schelmischen Lächeln, wie das Menuett als Scherz entstand. Wenn Paderewski in Warschau weilte, spielte er häufig Mozart für zwei alternde Freunde. Nachdem er sein Mozart-Repertoire durchgespielt hatte, entschied er sich, etwas Eigenes im Stile von Mozart zu schreiben, um zu sehen, ob seine Freunde die Fälschung erkennen würden. Diese weigerten sich nach dem Vorspiel des halb improvisierten Stückes (ohne die Kadenzen, die erst später hinzugefügt werden sollten) zu glauben, es sei nicht von Mozart komponiert. Noch weniger wollten sie annehmen, dass sie gerade eben einer Aufführung durch seinen Komponisten beigewohnt hätten (Die Bezüge des Menuetts auf Schubert gingen offensichtlich an ihnen vorbei). Die Freunde vergaben dem Schelm und bestanden danach natürlich darauf, dass er sein Menuett bei seinen Besuchen immer spielen müsse, eine Bitte, die wiederholt wurde, wann immer auch Paderewski während seiner restlichen langen Laufbahn auftauchte. Die Erstaufführung des Menuetts im Konzertsaal erfolgte durch Anna Essipoff (1851–1914), die Frau von Paderewskis Lehrer Theodor Leschetizky. Durch ihre Förderung fand das Stück des bis dahin unbekannten Polen weite Verbreitung. Paderewski selber nahm sein Menuett sechs Mal auf Schallplatte auf—1911, 1917, 1922–1923 (zwei verschiedene Aufnahmen erschienen auf HMV DB379), 1926 und 1937. Der harmonische Hufschmied ist der vierte und letzte Satz aus Georg Fridrich Händels (1685–1759) fünfter Cembalosuite aus der ersten Folge seiner  Suites de Pièces pour le Clavecin, die 1720 in London im Druck erschien. Die Musik wurde mindestens schon in Händels erstem Jahr in London, 1710, komponiert. Es kann auch sein, der Komponist brachte die Suite vom Kontinent mit sich—eine Passage aus Händels 1704 geschriebener Almira ist dem harmonischen Hufschmied sehr ähnlich. Eine Bourrée von Richard Jones (1680–1740) ist dem Air von Händel angeblich auch fast gleich, außer dass sie in Moll steht. Aber man weiß nicht, ob Jones Händel vorausging oder folgte. Man kann allerdings mit Sicherheit sagen, dass das Air und die Variationen überhaupt nichts mit einem Hufschmied zu tun haben, weder mit einem harmonischen, noch mit irgend einem anderen. Die erfundene Geschichte, wobei Händel angeblich das Air zuerst von einem Hufschmied in Edgware (London) singen gehört habe, als er vor einem Regenguss bei einem Schmied Schutz suchte, wurde von dem notorisch einfallsreichen Antiquar Richard Clark (1780–1856) in seinen Reminiscences of Handel („Erinnerungen an Händel“, 1836) in Umlauf gebracht. Wahrscheinlich liegt die Herkunft des Untertitels eher beim einem Musikalienhändler namens Lintern in Bath, der ursprünglich zum Schmiedehandwerk herangezogen worden war, bevor er sich der Musik zuwandte. Man fragte Lintern ständig, das Air und die Variationen zu spielen, und so entschied er sich, selber einen einzigen Satz mit dem Titel Der harmonische Hufschmied herauszugeben. Allerdings konnte bisher kein Exemplar von Linterns Ausgabe handfest gemacht werden. Die früheste bekannte gedruckte Ausgabe der Musik, die diesen Titel trägt, stammt von 1819—in einer Bearbeitung für Klavierduett. Es gibt sieben Bände kurzer Stücke von Pyotr Tschaikowsky (1840–1893) mit dem Titel Morceaux. Der erste erschienen 1870, der letzte 1893: insgesamt 53 schmackhafte Häppchen. Op. 40 besteht hauptsächlich aus Tanzsätzen und quasi-Liedern-ohne-Worte von „mittlerem Schwierigkeitsgrad“ für Kinder. Die bekanntesten sind die zwei Chopin-ähnlichen Walzer (Nr. 8 in As, die Rachmaninow für gut genug befand, um sie auf Schallplatte aufzunehmen, und die trauernde Nr. 9 in fis-Moll). Im Chanson triste (in g-Moll) begegnen wir einem Tschaikowski in seiner effizientesten und wirkungsvollsten Form. Das schwermütige einleitende Thema des Chansons (vermerkt mit la melodia und dem Ausführungshinweis con molto espressione) schafft unwillig Platz für einen widerstrebend lebhafteren Mittelteil, bevor es zum Thema stiller Resignation zurückkehrt. Der großartige Benno Moiseiwitsch nahm das Chanson 1945 auf. Obwohl Jean (Julius Christian) Sibelius (1865–1957) schon im Alter von acht Jahren Klavierunterricht erhielt (den er bald gegen Violinunterricht eintauschte) und bei Busoni in Helsinki studierte, war das Klavier nicht sein bevorzugtes Ausdrucksmittel. Sibelius’s Orchester-, Vokal- und Bühnenwerke überschatten den Rest seines Schaffens so sehr, dass man von der Entdeckung seiner 134 verschiedenen Klavierstücke in 35 Opusnummern etwas überrascht wird. Nur wenige können den Vergleich mit dem Besten von Sibelius’s Kunst standhalten, und nur seine gefeierten Stücke Valse triste, Op. 44, Nr. 1 (eine Bearbeitung eines ehemaligen Orchesterstücks) und Romance in Des, Op. 24, Nr. 9 haben es jemals zu weiterer Anerkennung geschafft. Philip Martin legt uns überzeugend Die Fichte (Kuusi) ans Herz, eine ökonomische Skizze von rührender, und mancher mag vielleicht sagen, von charakteristisch grübelnder Melancholie. 150 Jahre lang waren diverse Mitglieder der Mason-Familie im amerikanischen Musikleben aktiv. Lowell Mason (1792–1872) war Komponist, Organist, Dirigent, einer der ersten Musikpädagogen und die führende Stimme zur Förderung des Chorsingens in seinem Land. Sein Sohn, Luther Whiting Mason (1828–1896), war ebenso ein geachteter Musikpädagoge, der 1857 zusammen mit Dwight Hamilton Baldwin, dem zukünftigen Gründer der Klavierbaufirma Baldwin, ein Kirchenliederbuch für Gemeinschaftssingen veröffentlichte. Luthers Bruder Henry war zusammen mit Emmons Hamlin Mitbegründer der Klavierbaufirma Mason & Hamlin. Henrys Sohn war Daniel Gregory Mason (1873–1953), der sich als Komponist und Pädagoge einen Namen machte. Lowell Masons jüngster Sohn ist unser Mann—William Mason (1829–1908), ein gefeierter Konzertpianist und Pädagoge. Er studierte bei Moscheles in Leipzig, bei Dreyschock in Prag und Liszt in Weimar. 1854 kehrte er in die Vereinigten Staaten zurück. Man behauptet, Masons Konzertreise von 1855 war die erste in Amerika, die sich ausschließlich auf Klavierkonzerte konzentrierte (d.h. ein Programm ohne „assistierende“ Künstler). Als William Mason der Konzertreisen müde wurde, ließ er sich in New York als Lehrer und begleitender Pianist nieder. Die einprägsame und wirksame (d.h. nicht zu schwierige) Tarantella in a-Moll ist der erste von Pieczonkas zehn Danses de salon, zu deren Titelfolge die nach Chopin klingenden Sätze Mazurka de concert, Valse in As und Grande polonaise héroïque, sowie die vielversprechende Aussicht auf einen Danse des fantômes, eine Wanda – mazurka brillante und einen Salonwalzer über Namen „BACH“ gehören. Albert (oder war es Alfred) Pieczonka (1828–1912) war höchstwahrscheinlich polnisch, möglicherweise von schlesischer Herkunft, und eine schwer fassbare Persönlichkeit. Trotz gewissenhafter internationaler Nachforschungen konnte der Autor hier bedauerlicherweise keine einzige biographische Information über den Komponisten ausgraben. Die viel gelesene Monatszeitschrift The Etude, die 65 Jahre lang (1883–1948) amerikanische Musiklehrer informierte, widmete seine gesamte Februarausgabe von 1915 (Band 33, Nr. 2) polnischer Musik. Auf Seite 128 steht ein kurzer Beitrag, „Hommage à la Pologne – mazurka“ (eines der Salontänze) von A. Pieczonka, aber im „Verzeichnis polnischer Komponisten“ in der gleichen Ausgabe wird sein Name nicht aufgeführt. Wahrscheinlich wurden die insgesamt über 40 zählenden Kompositionen von Pieczonka um die Jahrhundertwende herum komponiert. Sie erschienen bei verschiedenen Verlegern in den USA und im Ausland im Druck (unter anderem bei Schirmer, John Church, Augener und diversen anderen). Die 66 Klavierstücke, die Edvard Grieg (1843–1907) in zehn Heften unter dem Titel Lyriske stykker zusammenfasste, zeigen den norwegischen Komponisten von seiner besten Seite—ein Meister der Miniatur und der Tonmalerei. Die zwischen 1867 und 1901 komponierten Lyriske stykker vereinen die von Mendelssohn, Chopin und Schumann geprägte romantische Klaviersprache mit norwegischen Stilmerkmalen und einer Debussy vorausahnenden Version des Impressionismus (Glockenläuten, Op, 54, Nr. 6 wurde zum Beispiel fast zwei Jahrzehnte vor Debussys La cathédrale engloutie komponiert). Das Nocturne ist eine von Griegs lieblichsten Ergüssen, gleichsam wirkungsvoll in seiner Orchesterfassung: die Lyrische Suite (1904) besteht aus fünf der Op. 54 bildenden sechs Stücke, wobei das Scherzo ausgelassen und das oben genannte Glockenläuten ans Ende gereiht wurde. Victor Herbert (1859–1924), einer der großen Namen in der amerikanischen Musik leichteren Genres, ist heutzutage (wenn überhaupt) für seine beherzten Operetten bekannt. Die erfolgreichsten davon waren Babes in Toyland („Puppen im Märchenland“, 1903), das von der Geschichte über den Zauberer von Oz inspiriert wurde und Naughty Marietta („Freche Marietta“, 1910) mit dem unsterblichen „Ah, Sweet Mystery of Life“ („O süßes Lebensrätsel“). Zu Beginn seiner Laufbahn war der in Dublin geborene Komponist ein Cellovirtuose gewesen. Herberts Interpretation seines 2. Cellokonzerts (1894) regte Dvorák direkt zur Komposition seines eigenen meisterhaften Konzerts für dieses Instrument an. Aber nur wenige haben jemals Herberts Instrumentalmusik gehört. Heifetz zog es zu Herberts À la valse, das er in den 1940iger Jahren einspielte, und ein anderer Geiger, Maud Powell, nahm 1916 einen zweiten Walzer Herberts auf—Petite Valse (ursprünglich für Cello)—ein Jahr nach seiner Komposition. Sonst wurde wenig jemals auf Platte aufgenommen. Auf der hier vorliegenden CD packt Philip Martin einen dritten Walzer aus, der sich unter Herberts 24 Klavierkompositionen befindet. Der Komponist schrieb die 1900 entstandene La coquette – valse brillante zur Entspannung, nachdem er innerhalb von sechs Jahren eine Reihe von zehn abendfüllenden Bühnenwerken geschaffen hatte. La coquette ist ein attraktives Stück (in As mit einem Mittelteil in C-Dur), das Interesse an anderen Kompositionen Herberts weckt, besonders an jene, die sich mit solch faszinierenden Titeln wie La Ghazel („Das Gasel“), Marion Davies March („Marion-Davies-Marsch“), Get Together („Zusammenkunft“), On Your Way („Auf deinem Weg“) und Valse à la mode schmücken. Die letzten drei genannten Stücke veröffentlichte Herbert unter dem Synonym Nobel MacClure. Zdenek Fibich (1850–1900) ist ein bisschen auf der Strecke geblieben. Er verfügte über ein frühreifes Talent (erste Sinfonie mit 14), studierte in Prag und dann in Leipzig (Klavier bei Moscheles), bevor er in seine böhmische Heimat zurückkehrte, wo er als Dirigent und Komponist aktiv war. Man hielt seine über 700 Werke—Opern, Melodramen, Sinfonien und sinfonischen Dichtungen, Kammermusik und über 400 Klavierwerke—für originell genug, um Fibich zu den wichtigsten tschechischen Komponisten seiner Zeit zu zählen. Unter Fibichs Klavierwerken befinden sich die zwischen 1892 und 1896 veröffentlichten 171 Stimmungen, Impressionen und Erinnerungen. Für Fibich sind diese Stücke, was die Lyrike stykker für Grieg sind. Eines davon, das einzige Stück übrigens, das Fibich andauernden Ruhm gesichert hat, ist das vormalig gefeierte Poème. Es bereiste die Welt in diversen Verkleidungen, besonders beliebt war die von Jan Kubelik geschaffene Fassung für Violine (die er 1910 aufnahm). Das Poème erschien auch als Lied mit einem Text von einem gewissen Arthur Anderson unter dem Titel „In deinen Augen“. Ede (Eduard) Poldini (geboren in Budapest, 1869, gestorben in Corseaux, Schweiz, 1957) wurde für seine Bühnenwerke hoch verehrt—seit langem vergessene ernste und komische Opern, zu denen Vagabund und Prinzessin (1903) und Hochzeit im Fasching (1924, sie wurde in London 1926 unter dem Namen Love Adrift inszeniert) zählen. Von den 156 Opusnummern sind die meisten elegante Salonstücke für Klavier. Seine Étude japonaise, Op. 27, Nr. 2 (1907) erfreute sich für eine gewisse Zeit großer Beliebtheit, aber man erinnert sich heutzutage an den Komponisten aufgrund seiner Poupée valsante („Walzer tanzenden Puppe“). Die Beliebtheit dieses Stückes wurde noch durch Fritz Kreislers Bearbeitung für Violine (und zwei reizende Aufnahmen) gefördert. Der amerikanische Pianist und Gesangslehrer Frank La Forge verwendete es auch für ein Lied, das von Lily Pons auf Platte verewigt wurde. Die gesamte Marionetten-Sammlung, die keine Opusnummer zu haben scheint, wurde dem großen Dirigenten Arthur Nikisch gewidmet. Im Entstehungsjahr seiner zehn Woodland Sketches 1896 wurde Edward MacDowell (1860–1908) als „das größte musikalische Genie“, beschrieben, „das Amerika hervorgebracht hat“. Obwohl seine Musik tief in der europäischen Tradition eines Schumanns, Mendelssohns und Liszts verwurzelt ist, gehört MacDowell zu den ersten, die das melodische und rhythmische Material der Indianer verwendeten, und die die Schönheit der amerikanischen Landschaft in Musik einzufangen versuchten. Woodland Sketches enthält solch bildhaften Tonminiaturen wie From an Old Indian Lodge („Von einer alten Indianerhütte“), By a Meadow Brook („Der Bach in der Wiese“), From Uncle Remus („Von Onkel Remus“)—und To a wild rose. Von all den auf dieser CD vorgestellten Komponisten verdient keiner so sehr, in Vergessenheit zu geraten, wie Joachim Raff (1822–1882). Er war ein vielschreibender Komponist von wohltönenden Sinfonien, Konzerten, Ouvertüren, Kammermusik, Opern und Instrumentalmusik (214 veröffentlichte Werke plus viele andere in Manuskriptform). Er wurde von seinen Zeitgenossen hoch geschätzt und als eine führende Figur in der romantischen Bewegung verstanden. Nach seinem Tod wurde er fast völlig vergessen, obwohl sich in den letzten Jahren wieder ein Interesse an seiner Musik meldet, das sich in Aufnahmen seines Klavierkonzerts, seiner Ouvertüren, elf Sinfonien und zwei Violinkonzerte ablesen lässt. Raffs Cavatina, Op. 85, Nr. 3 war jahrelang ein unverwüstliches Lieblingsstück von Violinstudenten. Ein weiterer anhaltender Erfolg ward ihm durch ein anderes kurzes Stück beschieden, nämlich das hier vorgestellte Tongedicht über ein Mädchen an ihrem Spinnrad. La fileuse steht in Fis- Dur, und neben den vielen Hand-über-Hand-Effekten fordern ihre Moto-perpetuo-Sechzehntelnoten eine außgewöhnliche technische Fertigkeit. Das Stück gehörte zu den Lieblingswerken des legendären Vladimir de Pachmann (1848–1933), der das Stück zweimal auf Schallplatte aufnahm, 1907 und 1909. Der in Amerika (Edgeworth, Pennsylvanien) geborene und in Deutschland ausgebildete (von 1877 bis 1878 bei Franz Böhme und von 1884 bis 1886 bei Karl Klindworth) Ethelbert (Woodbridge) Nevin (1862–1901) hatte ein natürliches Talent für anmutige, melodiöse Vokal- und Klaviermusik. Sein Lied The Rosary („Der Rosenkranz“, 1898) war eine Zeit lang hoch in Mode. In den ersten dreißig Jahren wurden sechs Millionen Exemplare verkauft, wobei £80 000 in Tantiemen für den Komponisten und seine Nachkommen eingespielt wurden. Nevin lebte nicht lange genug, um die Früchte seines anderen Erfolgsschlagers Mighty Lak’ A Rose genießen zu können, den er im Jahr seines frühen Todes komponierte. Aber Narcissus allein hätte genügt, um Nevin für den Rest seines Lebens ein materiell bequemes Dasein zu sichern. Narcissus stammt aus einer Sammlung von fünf Stücken über Wasserthemen. Während Nr. 1, 3 und 5 (Dragon Fly, Water-Nymph und Barcarolle) ein bisschen zu anspruchsvoll für Amateurmusiker sind, und Ophelia (Nr. 2) langsam und fade, traf Narcissus genau den Nerv der Zeit. Wenn man einmal die Hand-über-Hand Effekte gemeistert (auf der letzten Seite muss die linke Hand aufwärts über vier Oktaven springen) und den harmonischen Verlauf im Mittelteil im Griff hatte, dann gehörte Narcissus mit seiner visuellen Komponente und gefälligen Melodie zum Pflichtstück für jenen Salonpianisten. (Marie) August Durand (1830–1909) begann seine Laufbahn als Organist, studierte in seiner Heimatstadt Paris bei François Benoist und bestritt hintereinander diverse Ämter an verschiedenen Kirchen der Stadt. Er beschäftigte sich auch mit Musikschriftstellerei und Komposition. 1870 erwarb er zusammen mit Schönewerk den Musikverlag Flaxland. Durand & Schönewerk, später Durand & Fils (1891) und darauf Durand & Cie spezialisierten sich auf das Herausgeben von Werken der bedeutendsten französischen Komponisten, zu denen Chausson, Debussy, Ravel und Saint-Saëns zählten. Durand konnte kaum den Anspruch erheben, sich mit solch berühmter Gesellschaft messen zu können, aber alle seine Werke, zu denen sein funkelnder, lange Zeit beliebter Walzer Nr. 1 in Es gehört, fanden willige Verleger. Dieses Stück ist als Durands Première valse bekannt—es gibt fünf andere Walzer, die alle völlig unbekannt sind—und man sagt, er sei dankbar leicht zu spielen … bis die schnellen Tonrepetitionen und Läufe in Quarten auf der letzten Seite (zumindest nach der Erfahrung des Autoren) Anlass zu einem verrückten Fingersalat geben.